At Two Bare Feet, 10’10” is a standard length for Allround XL inflatable paddleboards, and we even offer some 10’10” boards in our thinner Allround SUP design. Using a longer board can increase straight-line speed but may compromise manoeuvrability and responsiveness, depending on the width or volume. Therefore, using a moderate length board, such a 10’10” SUP, provides decent overall performance, with an optimal balance between speed and turning ability. 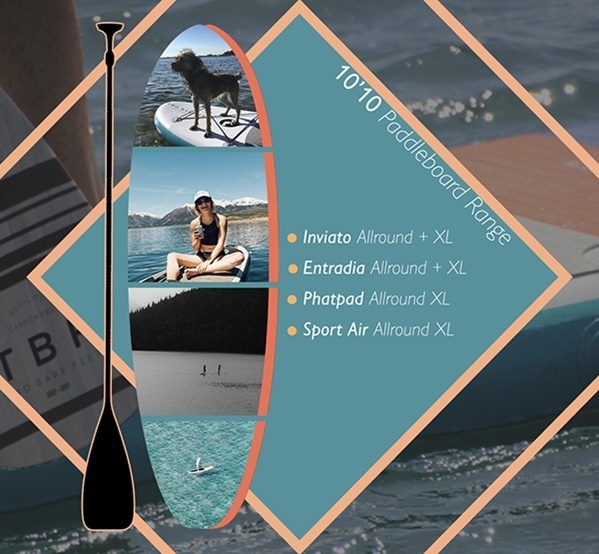 A 10’10” board can be used for a range of paddleboarding disciplines, from long-distance tours to surf-style riding, as well as general everyday use. Our Allround SUPs tend to measure 10’6” or 10’10” in length. These dimensions also apply to our Allround XL SUPs which have increased thickness to provide extra buoyancy for the larger/ heavier rider. Our wide variety of 10’10” SUPs are intended for an array of riders and are designed to meet individual requirements. The Inviato model is ideal for larger adults and those who are new to paddleboarding. With a 6” board thickness and an overall higher volume, the Inviato Allround XL is a board which can sustain heavier weights – perfect for a heavier rider who is seeking increased stbility. With a higher maximum payload, this board has the capacity to carry additional passengers, making it a desirable option for families who wish to share their boards on outings. The Entradia model is suited to small- and medium-sized adults or teenagers seeking an Allround-style board which can handle different conditions comfortably. With a width slightly above average for an Allround inflatable, the Entradia SUP offers substantial stability. These boards will float on top of the water so long as the maximum payload is not exceeded. This is ideal in choppier conditions. In addition, a minimal board thickness gives a lower centre of gravity which heightens stability on this board. This alternative 6”Entradia has an increased thickness of 6” which provides 50% more volume. This allows the board to accommodate up to 50% more weight than that of the standard Allround version, making it another suitable option for a heavier rider. This board can carry more weight whilst still sitting high in the water. The Phatpad Allround XL is suited to a wide range of riders seeking an Allround-style board. Its high buoyancy makes it work for smaller riders, while the substantial max payload and board volume will hold a large adult comfortably while standing, as well as a kneeling adult or child. Like all the boards in our Allround XL SUP range, the key advantage of using this board is its flotation which allows a normal amount of stability when used by riders that exceed the recommended payloads of the lower volume boards. Our Sport Air model caters for a wide range of riders and paddleboard disciplines. With a triple-layer underside, durability is prioritised with extra protection from punctures. The design and standard dimensions of this board provide an agreeable blend of stability, good tracking and ease of manoeuvrability. Again, its volume enables you to carry an additional kneeling adult passenger. In our 10’10” category, we have two premium double chamber boards which are particularly well- suited to Allround XL riders. These include the Phatpad Double Chamber and the Sport Air Double Chamber. These boards are the highest performing iSUPs you can invest in, offering overall stability, durability and safety. The key advantage of having two chambers is that air is distributed evenly throughout the board. This results in less chance of air displacement and improves the rigidness of the entire board by around 30%. Like the single chamber model, the Sport Air double chamber also has a third layer of PVC on the underside of the board for added durability. Why buy a 10’10” stand-up paddleboard from Two Bare Feet? Two Bare Feet have an incredible selection of paddleboards to satisfy our customers. We pride ourselves on delivering excellent-quality products, with a large range of different styles and designs to choose from. Each board variation is available in a selection of colours and comes with a choice of excellent accessory package options that provide everything you will need to get going.